The preceding chapter deals with methods describing the behaviour of product flows in chemical production plants to model the core components of chemical production networks in detail. 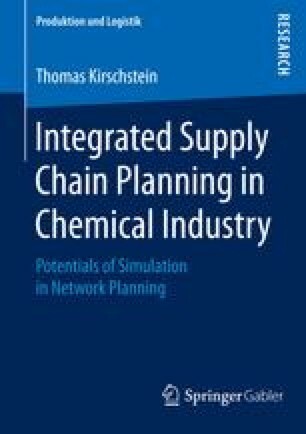 The next step in modelling product flows in chemical production networks is to describe product flows between chemical production sites and plants. At a site, intermediate chemicals are produced by some plants and consumed by some other plants whereby raw chemicals are only consumed and final chemicals are only produced. To buffer temporal imbalances of chemical flows, inventories are hold at the sites. Figure 3.1 shows the schematic chemical production network with added inventories symbols and highlighted chemical flows.